European stocks should continue to outperform in both local currency and US dollar terms this year due to a powerful combination of growth, liquidity, and valuation. 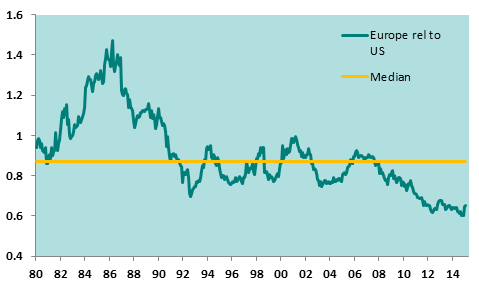 Since the post-crisis rally began in March 2009, US equities have outperformed their European counterparts by over 70% in dollar terms. Such disparity is easy to explain. From 2010 to 2012, the eurozone was gripped by a sovereign debt crisis. This crisis, and the austerity measures enacted to fight it, had a chilling effect on the region’s economy. Soaring unemployment, falling inflation and chronically deficient demand turned Europe into a frozen tundra, just as the US was gradually heating up. Understandably, investors shunned Europe in favour of the US. Yet when we consider the three traditional ingredients necessary to light a fire under a stock market – growth, liquidity, and valuation – all would suggest Europe is the more attractive destination for capital this year. 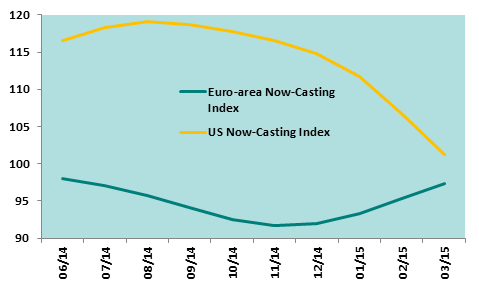 So far in 2015, European equities have staged a strong catch-up, outpacing their US peers by 16%. However, this is primarily due to a weakening euro. In US dollar terms, the outperformance is only about 5%. So, can European stocks get even hotter? After a difficult few years spent in deepfreeze, there are tentative signs that the eurozone economy is beginning to thaw. 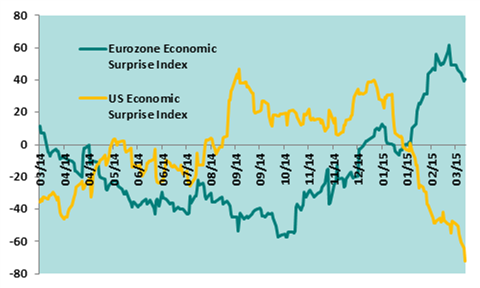 This can be seen in the Economic Surprise Index, which measures data releases relative to market expectations. On the eurozone version of the index, the mercury has recently surged into positive territory, suggesting forecasters have been too gloomy. Conversely, the US measure has fallen to icy levels last seen in 2012. Now-casting models paint a similar picture. By incorporating signals from a wide range of contemporaneous data, these offer a window on current economic activity, as opposed to backward-looking measures such as GDP. Several models have shown an improvement in the eurozone and a sharp slowdown in the US since the end of last year. Some even predict that the pace of economic growth in continental Europe will overtake that in the US this quarter. Lower oil prices are an important part of the nascent European turnaround story. With oil consumption accounting for over 2% of GDP, the euro area is clearly a major beneficiary of the oil-price crash. In fact, cheaper crude is helping household real incomes to rise at their fastest pace since the mid-2000s, meaning we may be on the cusp of a consumer recovery. Of course, the boost to consumption from cheaper energy will fade as the oil price stabilises. For a sustained recovery, the euro area needs business investment. It is therefore encouraging to see that European banks are easing credit conditions following burdensome stress tests. Moreover, companies are once again borrowing to invest rather than merely restocking inventories, demonstrating their growing conviction in the economic outlook. We know this by studying the latest ECB Bank Lending Survey. 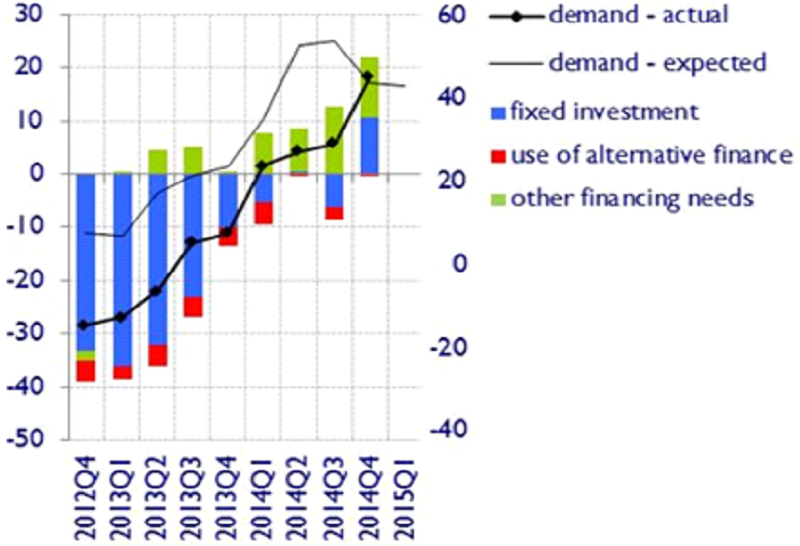 This notes that "fixed investment in particular...contributed to the increase in net loan demand by euro area enterprises, recording the first significantly positive contribution since mid-2011". Alongside business investment, the eurozone needs help from its governments in the form of public infrastructure programmes. Fortunately, after years of growth-sapping austerity, many European governments are now in a position to increase spending. Indeed, the primary fiscal balance in the euro area has moved from a deficit of 2.5% in 2010 to a surplus of 1.2% in 2014. Government spending will therefore contribute an expected 0.5% to GDP growth in 2015, and 1% in the periphery. This will be supplemented by the European Commission’s plan to invest over €300bn in new infrastructure projects over the next three years. Governments are also beginning to make progress on structural reforms – vital if the recent turnaround is to be sustained. Following courageous employment reforms, Spain has been transformed from a crisis-ridden European laggard to one of the region’s fastest-growing economies. Similarly in Italy, prime minister Matteo Renzi is attempting to abolish some of the most restrictive labour market laws and make the electoral process more conducive to further reforms. Progress is slow in Europe as a whole, but it is moving in the right direction. Also moving in the right direction is the euro. Since last July, the currency has fallen over 20% against the dollar. It now sits at a 12-year low and could be heading towards parity. When measured against a basket of the currencies with which the eurozone most often trades, the euro is also down 13%. Such weakness will be a shot in the arm for European companies, which obtain half of their revenues from outside the region. All this means that European earnings – now at a cyclical low – are like a coiled spring. By contrast, US earnings are already at record highs and must now contend with a stronger dollar. As a result, European earnings growth looks set to overtake that in the US for the first time since 2010. Just as growth prospects are beginning to improve, liquidity is starting to flow in Europe’s favour. While the US Federal Reserve has opened the door to the first interest rate rise in nearly a decade, the European Central Bank has moved decisively in the opposite direction by committing to a historic €1.1 trillion quantitative easing (QE) programme. This means it will create money by purchasing public and private bonds from banks with electronic cash that did not exist before. The idea is that banks take the new money and buy assets to replace the ones they have sold to the central bank. That boosts stock prices. It also raises bond prices and lowers interest rates. 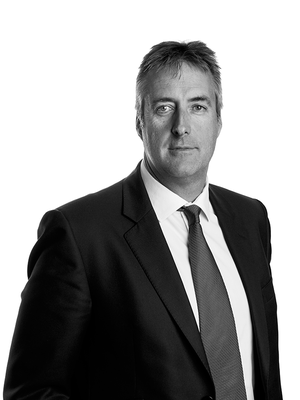 By reducing borrowing costs, QE should stimulate the real economy through improved lending, particularly as European banks are now sufficiently well capitalised following the Asset Quality Review. Lower borrowing costs will also allow businesses to fund share buybacks, providing further support for equity prices. In addition to QE-linked liquidity, European stocks have enjoyed record inflows of $35bn in 2015 as investors bet on a recovery in economic growth and corporate earnings. This is despite many US investors avoiding the region for fear of giving any gains back on a weaker euro. Once the currency stabilises, these investors could buy Europe en masse, propelling European equities higher still. Whether European stocks can outperform those in the US depends heavily on starting valuations. Given the positive developments already discussed, European shares aren’t cheap. Germany’s main stock index is at a record and others are at or near multiyear highs. But Europe isn’t as expensive as the US. Based on the Shiller PE ratio, which measures stock prices relative to average earnings over the past 10 years, European shares trade at a near-record 35% discount to the US market. When compared to bonds, valuations are even more attractive. In Germany, investors have a choice between a near-zero return from lending to the government, or investing in listed companies yielding 2.7%. These seemingly irrational valuations are partly a function of the fact that Europe continues to face serious political and economic problems. Even if the current turnaround is sustained, unemployment will likely remain at politically unacceptable levels as a 1% increase in GDP growth typically reduces euro area unemployment by just 0.3%. Thus, populist parties will continue to garner support, increasing the likelihood of future political crises. Similarly, the sovereign debt crisis is far from over as deflation increases already onerous debt burdens in real terms. While cognisant of these risks, we believe a powerful combination of growth, liquidity, and valuation will light a fire beneath European equities, allowing them to outperform their US peers in both local currency and US dollar terms this year.